FLEX Distilled magic in crystal form. The most dangerous drug in the world. Snort it, and you can create incredible coincidences to live the life of your dreams. FLUX The backlash from snorting Flex. 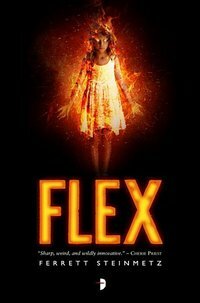 The universe hates magic and tries to rebalance the odds; maybe you survive the horrendous accidents the Flex inflicts, maybe you don't. PAUL TSABO The obsessed bureaucromancer who's turned paperwork into a magical Beast that can rewrite rental agreements, conjure rented cars from nowhere, track down anyone who's ever filled out a form. But when all of his formulaic magic can't save his burned daughter, Paul must enter the dangerous world of Flex dealers to heal her. Except he's never done this before - and the punishment for brewing Flex is army conscription and a total brain-wipe.